After traveling on several different frames, most notably Salsa Fargo and Surly Pugsley (both fat and 29er’d), the bike we found most fun to tour – on and off trail – is the Surly Krampus. It’s capable on rough trails and comfortable on longer stretches of paved roads. For the type of riding we enjoy most it is a natural choice touring rig. Both of our frames have been modified to allow some extra bottle cages; anything cage mounts on the bottom tube and standard bottle cage mounts on each of the seat stays. Rack mount bosses have also been added for places where the added volume of a more conventional rack and panniers setup is an advantage. The heart of our drivetrains are Rohloff hubs with external gear boxes laced to Velocity Blunt35 rims. They have been running reliably since day one. Saska loves hers from the very beginning and wouldn’t change to a conventional derailleur setup. For me riding with a Rohloff was, much like olives and paprika, more of an acquired taste. I didn’t like using the twist shifter initially and hated the added drag of gear 1-7, 6&7 being especially bad. Now after a few thousand kilometers and some oil changes the hub has been running much smoother and the twist shifter has grown on me. By now I might hate going back to derailleurs just as much as Saska. 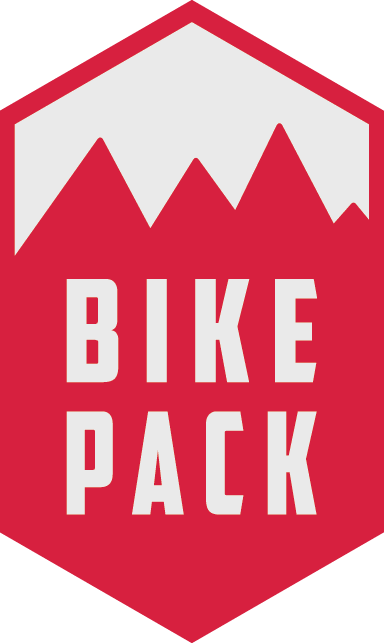 The BB7 breaks have become a golden standard for bikepacking. Although providing enough breaking power I’m slowly feeling the urge to try out some hydraulic options and risk some of those catastrophic failures I’ve been reading about. We could use some finer modulation for the toughest trails. A very well behaved fork with very nice compression damping regulation. Swapped from my frame as I felt 120mm was too much for frame’s geometry, had problems with the fornt losing contact on the steepest climbs. Saska’s very happy having it on her bike and doesn’t report such problems so far. The axle is a bit problematic to fit but very reliable once properly fitted. We have used Supernova E3 and E3 triple lights before, but like the Edelux II’s wide beam pattern much more. The E3 never really delivered enough light for off road riding and the E3 triple racing oriented long and narrow beam is more of use for fast paced cross country. The Edelux II has quite impressive low speed output and delivers a usable beam at walking speed, very nice for nighttime climbing, it also has a cool auto-on function where the light detects low light conditions. We like ours a lot. Solid hub for a reasonable price. We had some problems where the bearings prematurely worked themselves loose after riding with the supplied 9QR adapter for a prolonged period. Charlie from Intelligent Designs Cycles has been great to deal with and replaced our hubs, no questions asked – a real gentleman! The problem was most probably caused by a wrongly machined adapter that was wider than the hub’s axle, causing unwanted movement and premature bearing failure and should be fixed for new versions. A bit on the soft side, Saska made some nasty dents in the rim while riding in Scotland. Still at the time we build the bikes there was not many options for a 30mm wide aluminum rims. I’m careful with mine and have no signs of wear so far. Prior to using E-Werk I tested TourTerrain’s Plug II, but it didn’t really deliver enough power to charge anything else than a GPS device. For more power hungry device required a charging current of more than 500mA it would into an On/Off loop and stop working. The E-Werk is working very good for the past 4 years, though tt does require speeds exceeding 9 km/h to deliver any usable charging current. Great little pump we use as emergency spare. We were left with a half-working pump in the middle of nowhere while riding on Krk, Croatia – never again. I like the Krampus a lot more with 100mm suspension. The Reba is an OK fork, but the compression damping knob leaves things to be desired when compared to the Manitou and it generally feels inferior to Saska’s Manitou. I really like the rebound adjustment and I hate the stock supplied maxle. The used material is too soft material and the whole is too flimsy. I will have to look for a replacement or one day face a front wheel I cannot take off. The Maxle Stealth looks like something I’m looking for. I will never again complain about the Manitou HexLock axle. Cool but overpriced light, B+M makes a similar light, the TopLight small, for a fraction of Supernova’s price. The SON seems to have better power output than the Shutter Precision hub, at walking speeds I get a much brighter beam out of my Edelux II than Saska does. I used my custom Surly Ogre. It ended up with XT drivetrain, Marshall seat post, Hope BB, headset and hubs, DH bars, Mavic Kyserum rims, Avid cable discs, DMR Vault flat pedals and Fox 100mm front shocks. I travel light and use an XC carbon 10.5kg for touring now. Great bike and yours look a great build too. The Oger is still one of those few do-it-all bikes and a solid choice for a touring bike. I’m glad you like yours. After a few modifications, the Krampus makes a very capable touring bike and the new 2017 model makes it even better. So far we only changed the front chainrings to a smaller 30t size. We love it that way and it gives the bikes some crazy rock-crawling powers.